Farscape is a science fiction television series produced by The Jim Henson Company and Hallmark Entertainment for the Australian Nine Network. The series was originally commissioned by the Nine Network for five seasons, but was cancelled after the fourth season. After regaining the rights The Jim Henson Company produced a three hour mini-series to provide an ending to the stories of the show. The show Farscape revolves around the American astronaut John Crichton trying to find his way back to present day America after becoming stranded in the universe of Farscape. Crichton passed into a wormhole during the test flight of an experimental spacecraft and was picked up by a band of escapees in a space creature come space ship called Moya. Over the four seasons and mini series of Farscape, which began in 1999 the show tells the story of a growing romance between Crichton and enemy defector Aeryn Sun who is also picked up by Moya. The crew of the ship become central characters, each with their owen story arcs that progress of the seasons and the mini-series. Farscape was created and developed by science fiction television producer Rockne S. O'Bannon, who produced the 2009 version of V and Alien Nation. Co-creator was Brian Henson, son of Jim Henson and chairman of The Jim Henson Company. The television series was shown in countries around the world, including North American and the U.K. Farscape's final three hour mini-series was produced solely by The Jim Henson Company following a legal battle over the rights to the show. A series of comics based on the show have been produced and an internet based continuation of the Farscape story has long been rumored. John returns to Einstein in order to get the knowledge of wormhole weapons so he can force peace. Pilot and Moya refuse to endorse his plan, so he tries to use the Eidelons to initiate peace but there aren't enough of them to stop the battle. After thwarting Crichton's escape plan, Scorpius denies that he's a Scarran spy, and demands Crichton's help to destroy a cavern of vital Scarran flora - claiming it will also provide them with a better means of escape. And while Rygel and Noranti fight an evil Stark, Sikozu must reveal her true colors if they are all to survive. Moya's crew travels to Katratzi, a Scarran base where Scorpius is being tortured for wormhole information. The base is home to both Kalish and Charrid forces - underlings for the Scarrans. The crew plans to incite a confrontation between these two contingents, hoping this diversion will allow them to free Scorpius, and prevent wormhole knowledge from falling into Scarran hands. Aeryn is being held captive aboard a Scarran freighter captained by Jenek, who's determined to find out if Aeryn's carrying Crichton's child. To discover the location of the Scarran base where Aeryn is being taken, Crichton and Scorpius travel through a wormhole to a mixed-up "unrealized reality" version of Moya. As the others wait for their return, pursuing Peacekeepers draw closer. Having overheard Ahkna, the Scarran Minister of War, mention the secret Scarran base known as Katratzi, Sikozu is sure this is where the Scarrans intend to take their captive, Aeryn Sun. Though Moya's data banks have no record of Katratzi, Crichton's sure he's heard the word "Katratzi" somewhere before, if only he could remember where. Unable to sleep, Crichton pores over a documentary intercepted from Earth that examines the visit by "aliens" - Moya's crew - and discovers that the documentary just might hold the key to locating Katratzi - and Aeryn. Scorpius takes Crichton, D'Argo and Rygel into an advanced training camp where students learn mental discipline. D'Argo is confronted with the arrival of Macton, the Peacekeeper who murdered D'Argo's wife, Lo'Laan, then framed him for the crime. When Scorpius forces Crichton into torturous anti-Scarran training, D'Argo must face the demons from his past... alone. The crew travels through a wormhole to Earth, 1985, and Crichton finds he has somehow disastrously changed the course of time - his father Jack is now slated to fly the doomed Challenger mission. Lying low in Crichton's home town, the 'aliens' use the timely Halloween celebrations to remain (almost) anonymous, while Crichton tries to revert the timeline - in the process putting his younger self in mortal danger. Crichton is sucked down a wormhole he correctly senses will appear near Moya. Within "wormhole limbo" he is confronted by an interdimensional being who is intent on discovering why Crichton was entrusted with this knowledge. The alien sends Crichton through various "realities" of past events to illustrate how dangerous it can be if wormhole knowledge is misused. While in quarantine high above the patriarchal planet Khurtanan, the crew shares a meal of alien mollusks and almost instantaneously suffers a violent physical reaction. Each crew member becomes bodily linked to one of the others, Crichton to Sikozu, Aeryn to Rygel, and so on. It soon becomes clear they have been deliberately poisoned by the local doctor and are being blackmailed in exchange for the cure. The crew lands on a planet divided by generations of clan war. After experiencing strange hallucinations, Aeryn is subliminally coerced into assassinating a clan leader. When Crichton also starts having hallucinations, they must uncover the planet's political machinations in order to prevent more killings. When Moya is raided by bounty hunters working for the Peacekeepers, every crew member is captured except for Crichton and Noranti. The armoured intruders shrink the captives and imprison them inside holding cavities in their torsos - if Crichton harms them, he endangers his friends as well. Finding that Scorpius is also free and on the run, Crichton teams up with him to fight off the menace, unaware that the leader of the bounty hunters has a hidden agenda. Chiana and Crichton are sucked into a game world ruled over by a virtual Stark, who sends Crichton on a quest to 'Kiss the Princess'. To escape the game, they are forced to battle old friends and enemies in fantastic guises. Meanwhile, aboard Moya, Scorpius escapes and brings the crew under his control. Crichton correctly predicts a wormhole's appearance near Moya, but simultaneously a giant space plant captures the Leviathan. An attack with D'Argo's ship only succeeds in sending the plant into Moya's conduits, making it even more difficult to kill. Eventually, an agent is found that will repel the plant, but it only exists in Scorpius' cooling rods. In order to save Moya, Crichton will have to place trust in his arch nemesis. D'Argo and Sikozu come up with a plan to crash Elack onto the Peacekeeper pursuit craft, facilitating their escape. Crichton is forced to consort further with Grayza to ensure success. When the plan goes awry, the crew begins a search for the probe that will reverse the planet's deadly atmospheric conditions, but a most unexpected enemy stops them in their tracks. Crichton, Chiana and Rygel are reunited with D'Argo and Jool at an archaeological site run by Jool's people, the Interions. The purpose of the dig is to find a missing probe that might reverse the planet's dangerous atmospheric conditions. Peacekeepers led by Grayza land and capture the crew, and Crichton finds himself unable to fight back, mysteriously compelled to do Grayza's bidding. Continuing work on his theories of wormhole technology, Crichton ekes out an existence on board Elack - an old, dying Leviathan. The peace is shattered by the intrusion of a female alien, Sikozu, and a squad of Grudek mercenaries intent on harvesting Elack's neural tissue. Crichton fights to save his new home, his struggle hindered by the Grudeks' pet: a vicious and deadly alien canine called the Brindz Hound. Moya transports the remains of Talyn to a sacred Leviathan burial ground. Those on board are at a crossroads, each wanting to pursue a separate path. Crichton dreams of returning to Earth with Aeryn at his side, but Aeryn is unsure. Upon entering the graveyard, Moya is attacked by a huge male Leviathan. The crew must team up once more to save their home, but it seems that no matter which way the battle goes, their intertwined fates are sure to unravel. Grieving for Crichton, Aeryn travels to a planet of mystics and frauds and makes contact with a man who claims to be Talyn Lyzcak, her father. Talyn puts her in touch with Seer Cresus, a creature who is able to 'channel' the dead Crichton. Meanwhile, Stark and Rygel search for Aeryn, but first come across an old enemy. Lurking on the planet with malign, warped designs of her own is Aeryn's mother, Xhalax Sun. A fight between D'Argo and Crichton over the malfunction of D'Argo's mysterious new ship ends with Crichton being knocked unconscious. The Scorpius Clone in Crichton's mind tries to convince John that revenge against D'Argo is the only way to settle the conflict, but John prefers to resolve it in his own head, acting out a Crichton vs. D'Argo cartoon battle set in Road-Runner land. Meanwhile, the ship malfunction leads to the activation of a self-destruct sequence that threatens to blow Moya to pieces should D'Argo fail to deactivate it. An Ancient - again taking the form of Crichton's father Jack - appears on Talyn and accuses Crichton of sharing wormhole stabilising technology with the Charrids, a vicious race who have formed an alliance with the Scarrans. Crichton realizes that Furlow, the mechanic from Dam-Ba-Da depot who once repaired Crichton's module and had a mercenary interest in wormhole technology, is the real guilty party. With a Scarran Dreadnought heading towards Dam-Ba-Da to collect Furlow's data, Jack must unlock the wormhole technology in Crichton's brain in order to build the ultimate weapon - but must first confront the evil Scorpius Clone in Crichton's mind. Talyn draws dangerously close to a star, pulled by some mysterious force. Coinciding with this event is the appearance on board of two alien beings: the timid Sierjna and her captor, Mu-Quillus. Crichton and the others learn that Mu-Quillus is responsible for the radiation pulses that are compelling Talyn to fly into the sun and that eighty-three Leviathans have already died in this way. Stark makes a pact with Sierjna to free her spirit from Mu-Quillus and let her pass into the afterlife. However, Stark is acting of his own accord, and his quest to save Sierjna puts the rest of the crew in dire peril. With his wormhole research stalling and his situation desperate, Scorpius inserts the original 'neurochip' into his own brain. He hopes to make contact with the clone of John's personality that spilled into the chip when it was in Crichton's brain. When they meet, Scorpius shows the 'Crichton Clone' his terrible, brutal upbringing at the hands of the Scarrans, hoping to persuade him to decode the wormhole equations. Meanwhile, a defecting Peacekeeper scientist offers the real Crichton the secret of wormhole travel in exchange for Moya. After passing through a magnetic cluster, the crew experiences strange blackouts and periods of lost time. They discover that Pilot has been possessed by a being who is pursuing an evil 'Energy Rider'. The being inside Pilot warns our crew that the Rider inhabits one of them, and if that person isn't found - and the Rider extracted - the crew will all die. Crichton has been duplicated into two identical Crichtons. Moya's crew, trying to buy a healing agent for the injured gunship Talyn, becomes embroiled in a planet's deadly politics. Meanwhile, Aeryn discovers that her own mother, Xhalax Sun, is leading the Peacekeeper Retrieval Squad sent to recapture Talyn. The crew of Moya come across a diseased Leviathan used by the Peacekeepers as a prison for the criminally insane. It has been taken over by an individual who "twins" the humanoid inhabitants of the ship and uses them as a food source. Stark's power combines with goggles that look backward in time, which pulls Moya's crew back in time to the site of a legendary Peacekeeper battle. While searching for a planet to heal the dying Zhaan, Moya collides and fuses with a small spacecraft, seriously injuring Moya and trapping both ships in a series of looping wormholes. Crichton and the captain of the other ship, Neeyala, soon realize that one of the ships must be sacrificed if any of them are to survive. Although Scorpius's neural chip has finally been removed, Crichton feels he has no reason to live - Aeryn is dead, his power of speech is gone, and the clone of Scorpius's personality inexplicably remains in Crichton's mind. What's more, the crew of Moya discovers that they have more than just Crichton and Scorpius to deal with. Lurking somewhere in the Medical Facility is a murderous Scarran. Typically, the annual Electronic Entertainment Expo is only big TV news to those who could tell you without checking a cable guide when the next showing of "Campus P.D." is on G4 or the exact angle and curvature of Olivia Munn's left nostril. But exactly do you say when an upcoming game is also set to join Syfy'ss viewing lineup? This year's version of the annual video game expo also marks the debut of "Defiance," a massively multi-player (that's MMO, in gamer parlance) shooter that's soon available across multiple gaming platforms. Farscape is currently available to watch and stream on Syfy. 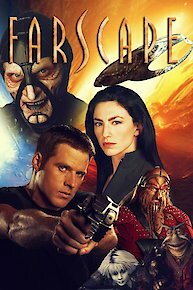 You can also buy, rent Farscape on demand at Amazon Prime, iTunes online.